A Sainsbury store sign in south London. 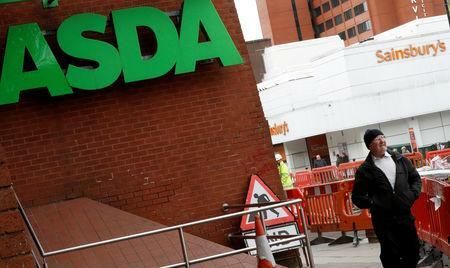 LONDON (Reuters) - British supermarket groups Sainsbury's and Asda have committed to deliver 1 billion pounds ($1.3 billion) of annual price cuts as they attempt to salvage their proposed combination after being dealt a potentially fatal blow by the regulator. The Competition and Markets Authority (CMA) last month said its initial view was that Sainsbury's 7.3 billion pounds ($9.7 billion) takeover of Walmart's Asda should be blocked in the absence of the sale of a large number of stores, or even one of the brands. 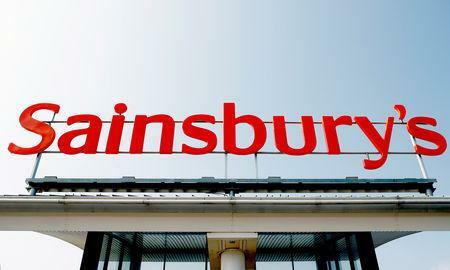 "Sainsbury's and Asda strongly disagree with the CMA's Provisional Findings and have found the CMA's analysis of their proposed merger to contain significant errors," the supermarkets said on Tuesday. The two groups said these errors were compounded by the CMA setting a threshold for identifying competition problems "at an unprecedentedly low level" which generated "an unreasonably high number of areas of concern." Sainsbury's shares, down 25 percent over the last six months, were up 2.5 percent at 1215 GMT. Sainsbury's and Asda said they would invest 300 million pounds in the first year after combining and a further 700 million over the following two years as cost savings flow through. Sainsbury's and Asda had previously said they would cut prices on "everyday items" by around 10 percent, financed by 1.6 billion pounds of cost savings, but had not quantified the impact in cash terms. The CMA's final report is due by April 30.